Edvard Munch, acclaimed as Norway's greatest artist, created a body of art that was concerned with the psychological predicament of the individual in the modern world. He was an artist who, perhaps more than any other, was representative of the Symbolist decade. Wherever he traveled he became involved in artistic revolution. Towards 1889, Munch frequented the Symbolist bohemia of Christiania in Norway, home of to a freethinking group of artists. In 1889 he won a government art scholarship to Paris and remained there for three years where he was strongly influenced by Van Gogh, Gauguin and Toulouse-Lautrec. His travels then took him to Berlin, where an exhibition of his paintings in 1892 created such a furor that the exhibit was closed by the authorities. Munch became famous overnight. He remained in Germany for a number of years to watch the impact of his art serve to turn German art towards an emotional and spiritual path. On his return to Paris, he became part of the circle of the Symbolists and he designed the sets for "Peer Gynt." Returning to Germany he created the stage sets for Ibsen's "Ghosts." Munch was carried along by the great contemporary movements and played an important role in uniting the intellectual messages that were sweeping across Paris, Berlin and Oslo. His art is concerned not with pictorial representation but with reflecting the inner life of his contemporaries. He was gifted with a psychic sensitivity which during this era was evidenced by his fellow Norsemen, Ibsen, Strindberg and Kierkegaard, who shared Munch's vision of the world bathed in a peculiar nocturnal light in which man moved as transparently as a shadow, but became real, embodied in the interiority of the psyche. Long before Freud formalized his work, these Scandinavian artists achieved astounding insights into the minds of men and the mechanism of psychic impulses. Often this art concentrated on the tragic, the neurotic, the death instinct, on the conception of life guided by an inner voice and destined by Fate. Munch's psychic gifts are revealed in works, which penetrate beyond external appearances to the inner conditions of the subjects he paints. In his most famous work, "The Scream," long, wavy lines seem to carry the echo of a tormented scream into every corner of the picture. Munch infused his painting with psychic realities-which he called the "Panic" forces - that are otherwise concealed behind visible reality. 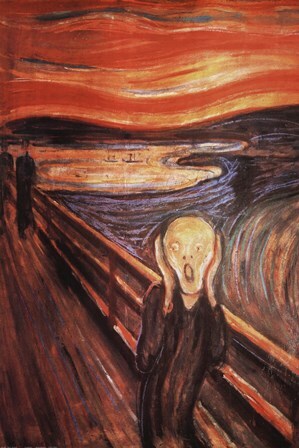 In 1908, a severe nervous breakdown forced Munch to return to Norway permanently. As his health returned, his painting turned away from the psychic, towards to more physical manifestations of life, towards a concern with universal images. In 1912, along with Cezanne, Van Gogh and Gauguin, he was given a place of honor at the great Sonderbund exhibition in Cologne devoted to a retrospective survey of modern art.